AirPura C600DLXW (C600DLX-W) Central Air Purifier for Heavy VOCs is a Specialty AirPura Air Purifier for Large Scale VOC and Specific Chemical Removal in a whole house. AirPura C600DLXW (C600DLX-W) Central Air Purifier for Heavy VOCs delivers a superior performance in continuous cleaning of the air from heavy VOCs and hard-to-remove specific chemicals throughout the whole house via air duct of a house's central ventilation and air conditioning system. AirPura C600DLXW Central Air Purifier for Heavy VOC is an equivalent of the AirPura C600DLX portable air purifier. AirPura C600DLXW employs a similar size 3-inch activated carbon filter canister with massive amount of specialty activated carbon adsorbent (26 lbs.). Such a large amount of specialty adsorbent guarantees fast and effective removal of VOCs and hard-to-remove specific chemical substances in high concentration. AirPura C600DLXW Central air purifier cleans the air in the whole house through the air duct of a central home ventilation and air conditioning system (HVAC / furnace). When to Use AirPura C600DLXW Central Air Purifier? AirPura C600DLXW air purifier is indispensable air cleaning device when it comes to dealing with High concentrations of Volatile Organic Compounds (VOCs) and specific chemicals in a whole house up to 2000 sq. ft. The typical application of AirPura C600DLX includes removal of VOCs from fresh paint, wallpaper, oil based paints, office machines, paint thinners, exhaust fumes from nearby traffic area, formaldehyde released by particle board, stains and varnish (lacquer) in new furniture, stain retardants and fire retardants in new carpeting, VOG (volcanic smoke and gases), wildfire smoke, etc. 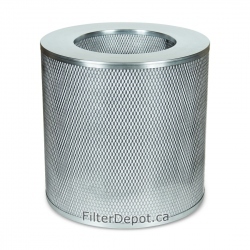 Oversize 3-inch deep activated carbon filter canister with Specialty adsorbent. The core of AirPura C600DLXW central air purifier's air filtration system is the oversize activated carbon canister. It contains a massive amount (26 lbs.) of Specialty enhanced granulated carbon adsorbent in 3-inch deep canister. Such a massive volume of adsorbent combined with an extended dwelling time in 3-inch deep carbon bed renders the unparalleled adsorption capacity in removal of Heavy VOCs and specific chemical substances in high concentrations. As a particle filter, AirPura C600DLXW central air purifier employs the HEPA-Barrier post filter to provide an adequate filtration of the air from most common allergens and dust. The adsorbent used in AirPura C600DLXW air purifier filter canister contains a blend of Coconut shell based activated granulated carbon with special additives such as, potassium iodide and potassium permanganate. The additives significantly improve the ability of activated granulated carbon to remove specific chemicals and VOCs. 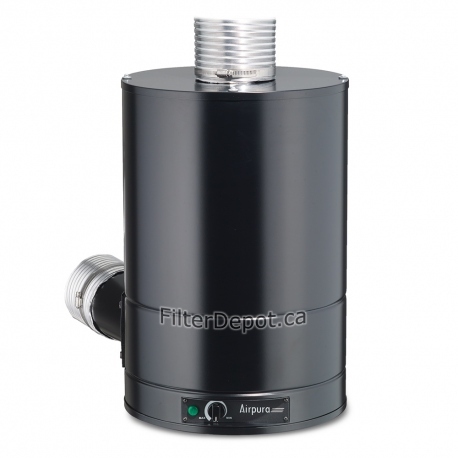 The Pre-filter is the the first stage of the air filtration system of all central and portable AirPura air purifiers. 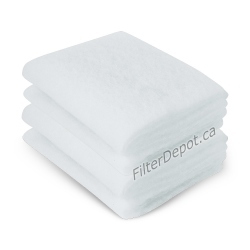 The pre-filter traps most of the larger dust and dirt such as, lint, hair, large dust particles to provide a protection to fine True HEPA filter from faster contamination and extend its lifetime. The AirPura C600DLXW central air purifier employs the 1-inch thick standard polyester based pre-filter. 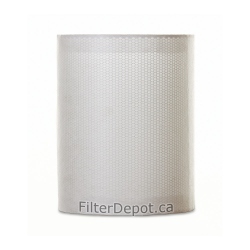 To keep it clean, the pre-filter can be removed and vacuumed using a soft brush. The pre-filter needs to be replaced with new one when it gets very dirty or ruined (usually every 9 to 12 month or so). AirPura C600DLXW employs powerful, yet energy efficient Motor/Fan assembly with variable speed control rated at 560 CFM (open air). The variable speed control allows the users to adjust the air filtration rate by selecting the speed setting that is the most appropriate for any particular air cleaning application or air cleaning performance. The motor and electric components are placed in a separate compartment to ensure that the already filtered air passed through the air filtration system doesn't get re-contaminated by off-gassing from hot motor windings (coils) and other electric components. AirPura C600DLXW central air purifier in a Standard configuration comes for North American electric power supply of 120V, 60Hz - (Canada, USA, Mexico). The optional motor and power cord for 220-230V, 50Hz electric power supply is available for overseas customers at Extra cost. AirPura C600DLXW features the all metal durable, impact resistant fully enclosed housing design available in a single Black color. To ensure a simple connection to the air duct, the AirPura C600DLXW central air purifier is equipped with standard 5-inch hose attachment for Polluted air intake (top panel of the unit) and Clean air outlet (bottom of the unit on its side). If easy mobility is required, the AirPura C600DLXW air purifier can be equipped with 4-Wheel casters on the bottom panel at No Extra Cost. AirPura C600DLXW air purifier comes with one of the most comprehensive limited manufacturer's warranties in the air purifier industry. - Additional 5-Year warranty on labor - the most expensive portion of the total repair cost. That brings a total duration of the Limited Manufacturer's Warranty to 10 Years. As a central air purifier, AirPura C600DLXW requires connection to the furnace's (HVAC) air duct using the 5" diameter flexible or rigid hose connected to the Polluted air Intake and Clean air outlet attachments. The AirPura C600DLXW whole house air purifier can be installed Free standing on the floor or suspended on the wall using the optional Wall brackets with secure straps. 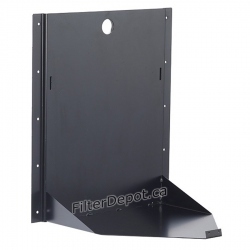 Which type of wall brackets to use depends on the available room near the HVAC (furnace), the air duct configuration, type of connection to air duct and on the User preference. 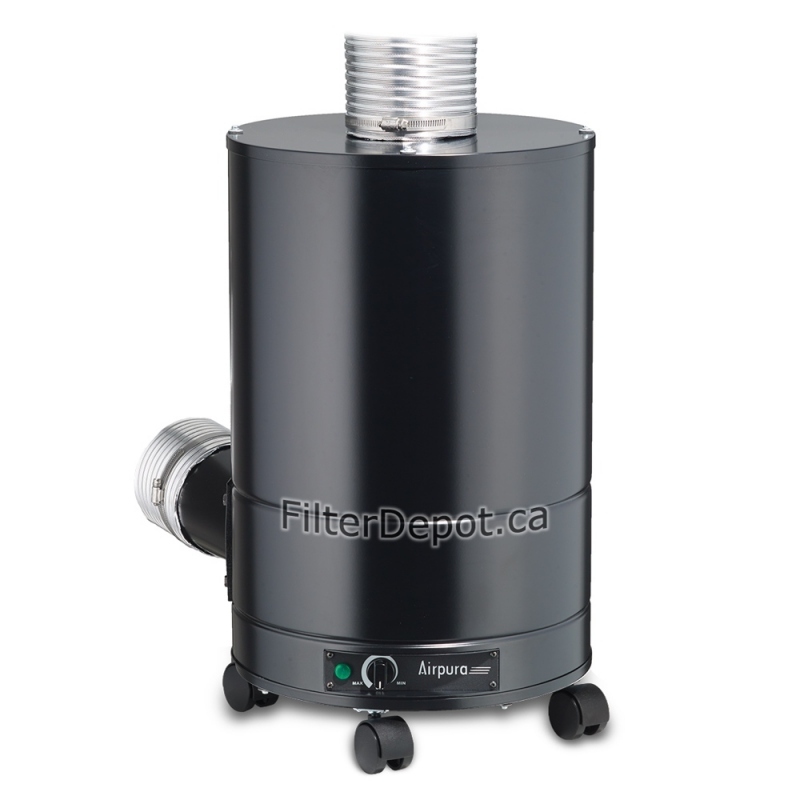 AirPura C600DLXW air purifiers ship free of charge by FedEx Ground delivery service in Canada and the Continental USA.